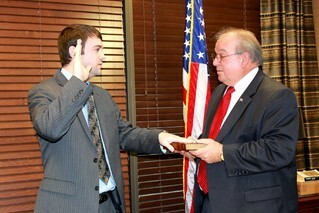 Assistant District Attorney Ross Murray has joined the staff at the Calcasieu Parish District Attorney's Office. Murray is a proud native of Oberlin, Louisiana. Following graduation from Oberlin High School, he attended McNeese State University where he obtained a B.S. in Criminal Justice with a minor in Sociology. Murray then went on to attend law school at the Paul M. Hebert Law Center at Louisiana State University. Upon completing law school, Murray returned to Allen Parish where he served as an investigator and Assistant District Attorney for the Allen Parish District Attorney's Office. While working under District Attorney Todd Nesom for two years, Murray conducted both misdemeanor and felony trials. Murray has spent the last year at the Lake Charles firm of Spears and Gary, LLC. He now returns to his roots as a prosecutor where he will serve as a Misdemeanor Assistant District Attorney.